Unlike searching on a desktop or laptop computer, when you're searching on a touch-screen mobile device it’s often inconvenient to type. So we strive to give you a variety of ways to interact with Google, be it by speaking your queries,getting results before you finish typing, or searching by image. Now there’s a new way for you to interact with Google: Handwrite for web search on mobile phones and tablets. Say you’re standing on a busy street corner, in a bumpy taxi ride, talking with a friend, or sitting on the couch with your tablet. Handwrite enables you to search by just writing letters with your finger most anywhere on your device’s screen—there’s no keyboard that covers half of the screen and no need for hunt-and-peck typing. 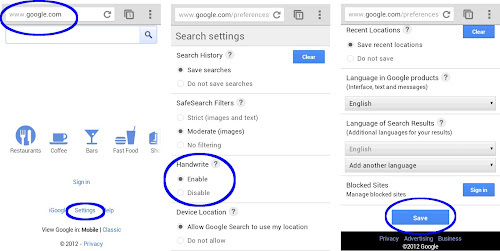 Getting started is easy: go to Google.com in your mobile browser, tap on “Settings” at the bottom of the screen and enable “Handwrite.” Note that after you've saved the setting, you may need to refresh the homepage to see the feature. On tablets, the Search settings are available as an option behind the gear icon. Once the feature is enabled, tap the Handwrite icon on the bottom right corner of your screen to activate the writing surface. Write a few letters and you’ll see autocomplete options appear below the search box. If one of the options is what you’re looking for, just tap it to search. For longer queries, you can continue writing and use the arrows next to the autocompletions to move the right one into the search box. Since you can write anywhere, you don’t have to look back and forth repeatedly from the keyboard to the search box. For more tips and tricks on how to use Handwrite, see our Help Center article. To make accessing Google.com faster, be sure to bookmark it and add it to your home screen. We designed Handwrite to complement rather than replace typing: with the feature enabled, you can still use the keyboard at any time by tapping on the search box. Handwrite is experimental, and works better in some browsers than others—on Android devices, it works best in Chrome. For now, we’ve enabled Handwrite for iOS5+ devices, Android 2.3+ phones and Android 4.0+ tablets—in 27 languages. Have fun with this new way of searching!